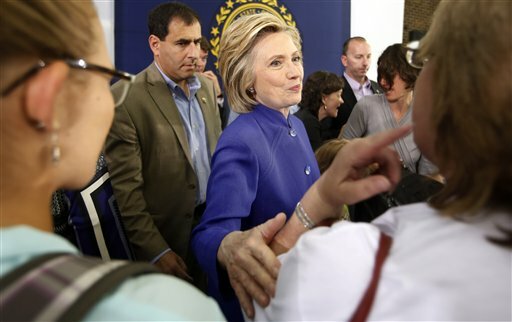 Home News Clinton turns over mail server to Justice Dept. Clinton turns over mail server to Justice Dept. Hillary Rodham Clinton’s presidential campaign casts her decision to turn over her personal email server to the Justice Department as cooperating with investigators. Her Republican critics suggest that the move and new revelations about classified information points to her malfeasance as secretary of state. Two emails that traversed Clinton’s personal system were subsequently given one of the government’s highest classification ratings, a Republican lawmaker said. Federal investigators have begun looking into the security of Clintons’ email setup amid concerns from the inspector general for the intelligence community that classified information may have passed through the system. There is no evidence she used encryption to prevent prying eyes from accessing the emails or her personal server. For months Clinton refused calls to give up the home-brew email server she used in her suburban New York City home to send and store email through a private account. She has defended her use of the server, saying she used it as a matter of convenience to limit the number of electronic devices she had to carry. She has said the server account never held classified information. Officials are investigating whether classified information was improperly sent, though it’s not clear if the device will yield any information. Her attorney said in March that no emails from the main personal address she used while secretary of state are on the server or back-up systems associated with it. In March, Clinton said she exchanged about 60,000 emails in her four years in the Obama administration, about half of which were personal and were discarded. She turned over the other half to the State Department last December. The department is reviewing those emails and has begun the process of releasing them to the public. On Tuesday, Clinton attorney David Kendall gave to the Justice Department three thumb drives containing copies of work-related emails sent to and from her personal email addresses via her private server. Kendall gave the thumb drives, containing copies of roughly 30,000 emails, to the FBI after the agency determined he could not remain in possession of the classified information contained in some of the emails, according to a U.S. official briefed on the matter who was not authorized to speak publicly. The State Department previously had said it was comfortable with Kendall keeping the emails at his Washington law office. Also Tuesday, Republican Sen. Chuck Grassley of Iowa said two emails that traversed Clinton’s personal system were deemed “Top Secret, Sensitive Compartmented Information” — a rating that is among the government’s highest classifications. Grassley said the inspector general of the nation’s intelligence community had reported the new details about the higher classification to Congress on Tuesday. Those two emails were among four that had previously been determined by the inspector general of the intelligence community to have been classified at the time they were sent. The State Department disputes that the emails were classified at that time. The inspector general for the intelligence community had told Congress that potentially hundreds of classified emails are among the cache that Clinton provided to the State Department. Earlier this week, Clinton said in a sworn statement submitted to a federal judge that she has turned over to the State Department all emails from the server “that were or potentially were federal records.” The statement, which carries her signature and was signed under penalty of perjury, echoed months of Clinton’s past public statements about the matter. Associated Press writer Lisa Lerer contributed to this report. Once again, Ms. Clinton has apparently forgotten the principle “lesson learned” that came out of Watergate. It’s not the crime, it’s the futile attempts to cover it up that eventually comes home to roost. Hmmm….now we hear from a reliable source investigating the issue that there may have been an attempt “by someone in her inner circle” to erase the classification on at least one of these emails. This is DESPITE the fact that it came from a source well outside of her control in the intelligence community and most certainly would have arrived in her inbox clearly marked as classified. So, now there’s apparently evidence of a “cover up of the cover up”. Could it be that Ms. Clinton needed all this time for her staff to “scrub” all the evidence so as to coincide with her initial “I didn’t do anything wrong” statement before turning all the emails over to the Justice Department? And, once again, when, oh when, will these politicians EVER learn that the cover up is ALWAYS worse than the crime itself? She would have been far better off to simply say, “I screwed up” and gotten beyond it.